Cowl light & Wiper Wire support 1928-29 Model A. Used on open cars to hold the wire going to the wiper motor. Also used to support the cowl light wire. 3 required per car. Made in USA. Cowl light & Wiper Wire support 1930-31 Model A. The wires that goes through the socket, and out the arm. Just like the original, yellow with black tracer. Set of 2. Made in USA. Cowl light Cross over wire 1928-31. This wire joins the two cowl lights, and runs one single wire down to the main lighting wire harness. Made in USA. Cowl light screw set 1930-31. Stainless screws with special shake-proof washers used to bolt the cowl light arm to the cowl light bucket. Made in USA. Cowl light Lens gaskets for the 1930-31 Model A cowl lamps. Set of 2. Made in USA. Cowl light Lens gaskets for the 1928-29 Model A cowl lamps. Set of 2. Made in USA. Cowl lights for the 1928-29 Model A. Beautiful reproduction of the original cowl lights, chrome plated. Comes with 6 volt bulbs. Set of 2. Cowl lights for the 1930-31 Model A Ford. Beautiful reproduction of the original cowl lights, in stainless with chrome arms. Turn signal cowl lamps 1928-29. Externally, these lights look just like our regular stock cowl lights, but these have the dual filament bulb and socket already installed for turn signals. These 1928-29 cowl lamps can only work with the 12-volt bulbs supplied. Set of 2. Turn signal cowl lamps 1930-31. Externally, these lights look just like our regular stock cowl lights, but these have the dual filament bulb and socket already installed for turn signals. These 1930-31 cowl lamps come with 12-volt bulbs, but can be changed to 6-volt. Order A-13304 bulbs to change. Set of 2. 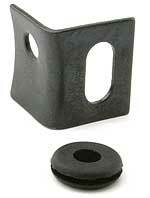 Cowl Grommets for the 1928-29 Model A Ford. Used on the 1928-29's only, these grommets go in the cowl panels where the arms go through. (The 1930-31's did not use a grommet). Made in USA. Cowl light mount support bracket for the 1928-29 Model A Ford. When installing cowl lights on your 1928 or 1929 Model A, you will need these brackets for inside the cowl section. Cowl light arms 1928-29. If your light buckets are in good shape, you can save a few bucks and replace the arms only. 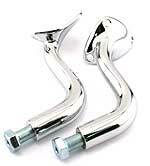 These are chrome plated. Set of 2. Made in USA. Cowl light arms 1930-31. If your buckets are in good shape, you can save a few bucks and replace the arms only. 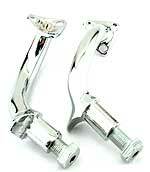 Chrome plated. Sorry but we can only get these in pairs. Cowl lamp marking tool 1930-31. This handy gadget takes the guess work out of drilling the holes in your cowl panels when installing new cowl lights. Made in USA. Cowl light visors 1928-31. Stainless steel with a red jewel. A nice era accessory. Set of 2. Made in USA. Cowl light wire connector 1928-31. This special bake-lite wire connector was used to connect the cowl light cross over wire to the main lighting wire harness. It was located at the base of the steering column. Made in USA. Turn signal conversion kit 1928-29. This kit will convert your cowl lights over to a dual filament bulb set up, so you can use your lights for parking lights as well as directional lights. 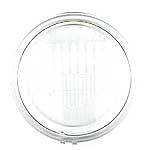 Kits are supplied with 12 volt bulbs, order A-13304 bulbs to convert to a 6 volt. Turn signal conversion kit 1930-31. This kit will convert your cowl lights over to a dual filament bulb set up, so you can use your lights for parking lights as well as directional lights. Kits are supplied with 12 volt bulbs, order A-13304 bulbs to convert to a 6 volt. Cowl light Arm mounting plate 1930-31. For the 30-1 cowl lights, this plate is the one on the inside of the bucket that the arm mounting screws screw into. Made in USA. 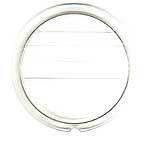 Cowl light Rim tab 1930-31. This small tab is the one that has one end tapped for the rim screw to go into. Made in USA. Cowl light rim 1928-29. Rim only, made of stainless steel. Comes highly polished. Made in USA. Cowl light rim 1930-31. Rim only, made of stainless steel. Comes highly polished. Made in USA. Cowl light Tab rivet 1930-31. Large hollow steel rivet that attches the A-13305 and A-13303 to the bucket of the cowl light. Made in USA. Cowl light lens 1928-29. A nice clear lens! Made in USA. Cowl light lens 1930-31. A nice clear lens! Made in USA. Cowl light retainer clips to hold the lens into the rim. 1 set does both lights. Made in USA. Cowl light wood blocks 1930-31. On 30-31's, they used a wooden block between the cowl panel, and the brace that the arm bolt goes through so the cowl panel will not indent when arm is in place. Set of 2. Made in USA. 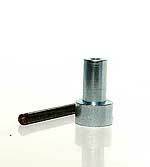 Cowl light mount bolt 1930-31. This bolt is for the 30-1 cowl lights. It is drilled for the wire to go through. This is the one that mounts the light to the body. Made in USA..
Cowl light socket 1930-31. Socket only for the 30-1 cowl light bulb. Doesn't come with pigtail, but does have a rivet with it. Made in USA. Cowl light socket 1930-31 Rivet Only. Made in USA. Cowl lamp reflector 1928-29. 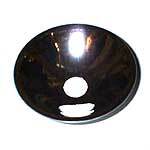 A chrome reflector with the bulb socket installed. These are for the 28-9 cowl lights. Cowl lamp reflector 1930-31. Replace those dull looking reflectors with nice shiny new ones. For 30-1's only. Made in USA. Amber cowl lamp lens 1930-31. 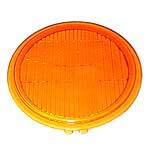 If you have converted your cowl lamps over to turn signals, these amber lenses make them a little more noticable. Made in USA.